Long and ramble-y. You've been warned. Look what I received in the mail on Saturday! Thank you Secret Pal! I'm looking forward to finding out who's been spoiling me so well these past few months! wait...I'm not allowed to start new projects until I finish the ones I'm working on! Speaking of WIP: Here's a shot of Eris, from the last time that I worked on it, on Saturday. I've finished the edging on the front left side, and am working on the front right side. It's actually a very clever construction: every other row (and occasionally more often) a stitch is picked up from the body and knit together with a stitch from the border. Not only does it look really nice, it also means that I don't have to bind off stitches at the bottom! Yay! I did make a boo-boo, though. I can't remember (I need to learn to write things down as I work) whether I used US 4's or 3's to make the cardigan's collar. I'm using 3's for the hem, but the cables look smaller then the ones on the collar. This is how it's supposed to look. I hope that it doesn't matter too much. 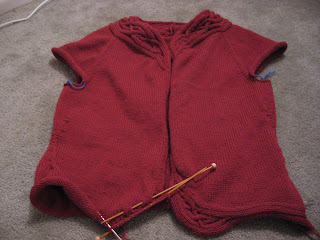 And I ought to have done the cabled raglan increases so that the cabled waist shaping would match. But I didn't notice that option until I was getting ready to start the waist shaping. Oh well. I've been rather social the past few weeks, as far as fiber hobbies are concerned. One of the LYS's here in town has just started having an open knit night on Wednesdays. I went the first night, and there were three of us there: one of the owners, and another girl and I. It was fun. I do knit in public sometimes, but I'm always the only one. It was nice to have other people to talk to about what they're doing. I also went last week, and there were seven or eight people there. It was fabulous! People talked about going to the Maryland Sheep and Wool Festival and about yarn habits and projects they want to do and things they're learning. This coming Friday, I think I'm going to go learn how to spin. I tried a drop spindle once, and it was kind of fun, but I think I'd like to try a wheel, too. I always thought it would be so cool to have an antique-looking spinning wheel sitting in my living room, pretending to be a decorative item, but actually knowing how to use it! Ooohhh, it smells GOOD in here! 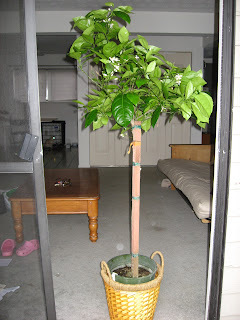 I bought a tree today. It's an Orange tree. 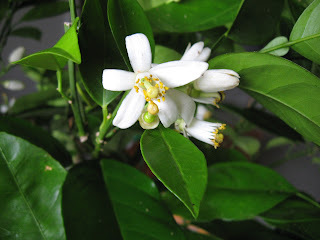 It's in blossom right now, so hopefully in a few months I'll have oranges! These are what the blossoms look like. They smell SOOOO GOOD! It's a very strong fragrance, really sweet with a hint of citrus in it. It's perfuming my living room as we speak. Oh, I've been knitting, too. Mostly on Eris, because I can see the light at the end of the tunnel, and I want to get it done. I've got less than five inches to go on the body, and then I only have the sleeves and a zipper left. 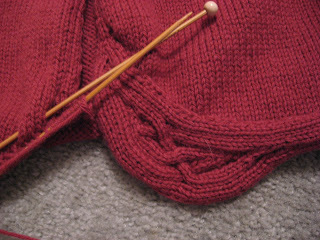 I'm hoping that sleeve island won't be too awful because this is a top-down raglan. I just have to knit until they're long enough (doesn't everyone?) but the rows get shorter as I move down toward the wrist. Here's a shot of the waist shaping. It looks kind of scary, actually, like a spider or some other beastie. Hopefully it will look better when I block it and wear it. New thing #1: I received a package in the mail today from my Secret Pal: Two skeins of sock yarn and Sensational Knitted Socks! THANK YOU!!! I'm intrigued by a couple of the mosaic patterns, I might try one, as soon as I clear out my WIP basket and can buy some sock yarn. I want something like Koigu, or maybe I'll buy something I've never tried before, like Socks that Rock or something. 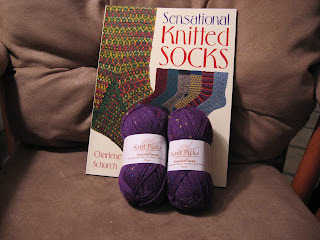 The purple sock yarn that my SP sent is definitely earmarked for something for me. It's so soft! And I'm glad that I received the book today. 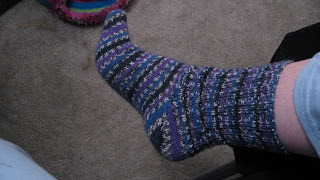 I'm working on my mom's socks, and I did one toe-up with a short-row heel. 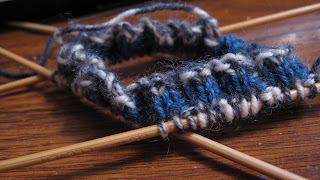 I was kind of getting bored with it by the end, so I decided to do the other top-down, and was wondering if it were possible to do short row heels on top-down socks. And the book happens to have instructions on how to do it. Perfect timing, SP! Thanks again! As I said, I'm working on my mom's socks. Nothing fancy at all, just a K2P2 rib on the leg. I started them on Tuesday, and finished one this evening. Not bad, if I say so myself. It looks fine when you put it on, but socks that have ribbed legs just look really weird when they're not being worn. The feet look out of proportion to the leg portion. 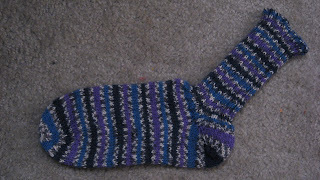 And here's the second sock, started top-down as I mentioned earlier. I wonder if I'll do this one as quickly as the first. 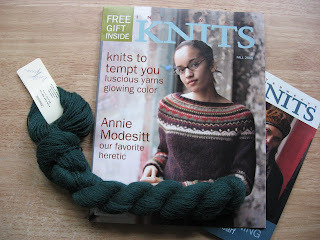 It would be really nice--I told my mom I'd knit her socks six months ago! And last but not least, look what I bought myself for my own (late) Christmas Present: It's a Canon PowerShot A540. It's not top of the line--I don't need anything that fancy at present. But it's much nicer than my old 2.0MP camera I've been using for the past few years (which, by the way, would probably only go for about 5 bucks on eBay--that's how behind-hand it is). This camera has also has the advantage of a lot of manual settings that I can grow into as I learn more about how to take pictures.